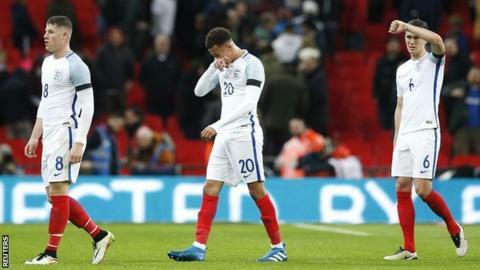 England boss Roy Hodgson said he was disappointed by his side's lack of creativity in their 2-1 defeat by the Netherlands at Wembley. "It was nothing like the performance I was after," said Hodgson. "We weren't as intensive or incisive as we were against Germany. "We weren't as creative but we had control over the game." He added: "It really is a high followed by a low." England slipped to a first defeat at Wembley since November 2013 despite taking the lead through Jamie Vardy - the 100th goal of Hodgson's tenure. But Vincent Janssen scored from the spot after Danny Rose's handball before Luciano Narsingh scored the Dutch winner 13 minutes from time. Hodgson thought the decision to penalise left-back Rose was harsh, and felt centre-back Phil Jagielka was fouled in the build-up to the winning goal. "I think we were hard done by," he said. "I don't think we deserved to lose the game, the way the two decisions went against us. "The second one in particular was exceptionally harsh. The first one is a decision that is given these days, which I unfortunately I don't agree with. "I really do believe to give handball it has got to be absolutely deliberate and not hit the hand when people are trying to block the ball. "I am becoming a dinosaur if I keep saying that because I see these decisions being given every week. Whether I agree with it or not, it doesn't make a lot of difference and it was given." Hodgson will name his Euro 2016 squad on 12 May, 10 days before England face Turkey in a friendly at Etihad Stadium. They then host Australia on 27 May at Sunderland's Stadium of Light and Portugal on 2 June at Wembley. "I gave a lot of different players a chance to play. I've really aired the squad, if you like," said Hodgson. "Hopefully that might be to my advantage in the future, when I am thinking about players and thinking about making decisions." Read more on England Euro 2016 squad: Who is going to France and who is staying?